2017 XTERRA Pan Am Champ, Michael Dorr, knows a little something about being scared and doing it anyway. 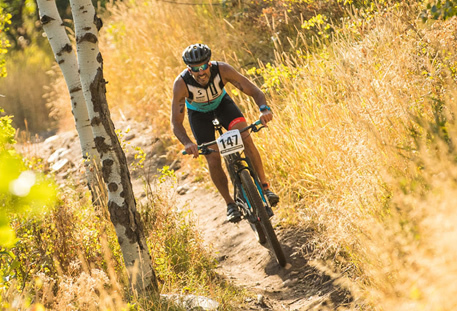 While he has been mountain biking for years, Dorr never entered an open water swim until his first XTERRA at XTERRA Beaver Creek. Because he’s so good on the bike, we asked Michael to share his top five tips for beginning mountain bikers so you can stay safe, gain confidence, and start to shred. If you look straight down at the ground, that’s where you are going to go, so you want to always look ahead of you. How far ahead you look depends on the terrain. If you are riding technical switchbacks and not going really fast, then looking five to six feet in front of you is good, because you won’t know what’s around the corner. But if you are on a straightaway or going downhill, you should be looking 20 to 30 feet in front of you so you can set your line and not have any surprises. Generally, when I take a turn, I lift my inside pedal and push down on my outside pedal. This keeps your pedal from hitting the dirt and it also gives you more power through the turns. For example, if I’m turning left, I push down on my right heel to leverage power and lift my left knee into the high position. Then I lean into the turns – your bike will go where you go. XTERRA terrain can be technical and punchy, meaning that you’ll go down a short, steep hill and then have to make a sharp turn and head back up. In these situations, it’s easy for your tire to slip on the climb, meaning that you have to get off and walk. I try not to ride in a big gear unless I know it’s pretty flat. Staying in the low gears makes it easier to keep your momentum. My rule for setting a line is that I try to avoid the nastiest parts. If you are looking 20 feet ahead, focus on the easiest route with the fewest obstacles. A good rule of thumb is to choose the line that will keep your wheels on the ground for as much time as possible. The most important thing you can do is get on your bike as much as you can. Don’t be scared of technical terrain. The more you slow down and think, the more hang ups you will have. If your wheels are rolling, you can get over features your mind doesn’t think you can, and you’ll realize, that wasn’t so hard. Find your line and go for it.